Heikin-Ashi Candlesticks are a special type of Japanese candlesticks which is calculated from a combination of current and previous day's price data. These unique type of candles filters out the noise in the markets and depicts the trend in a much smoother manner. 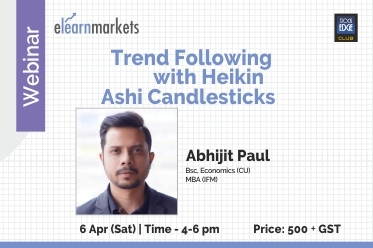 In this webinar, we will understand the intricate details of Heikin Ashi candles and create breakout or trend following trading strategies using them. Attendees will understand the concept of Heikin Ashi candlestick in detail and learn how to use them to visually understand the trend clearly and effectively. This simple candlestick charting technique will be used to know the trend of the market and also to pinpoint your level of entry and exit from a trade. Stop Loss management will be understood using these Heikin Ashi candles. I prefer to define myself with the 3is – investor-trader, instructor and influencer. With over 15 years of experience in the Indian Financial markets, I had been associated with institutions like ICICI Securities and BRICS Securities, Mumbai. Currently, I am a SEBI Registered Research Analyst and offer unparalleled services in both training and advisory. I have been an active trainer in the subject of technical analysis and trading for over 13 years and I tend to visit various business schools and institutions like NSE Academy, NIBM Pune, BIBS Kolkata, India Infoline, Kredent Academy & Elearnmarkets. I also personally conduct offline and online programs like Mentorship and Qualified Market Trader (QMT), which are both unique path-breaking workshops in designing and implementing different types of trading strategies. I had the privilege to be a regular face on many business channels like CNBC, Zee Business, Bloomberg & CNBC Awaaz and Moneycontrol, where I shared my views on the markets and Indian economy. Academically I am an MBA Finance from Mumbai and B.Sc Economics from the University of Calcutta.